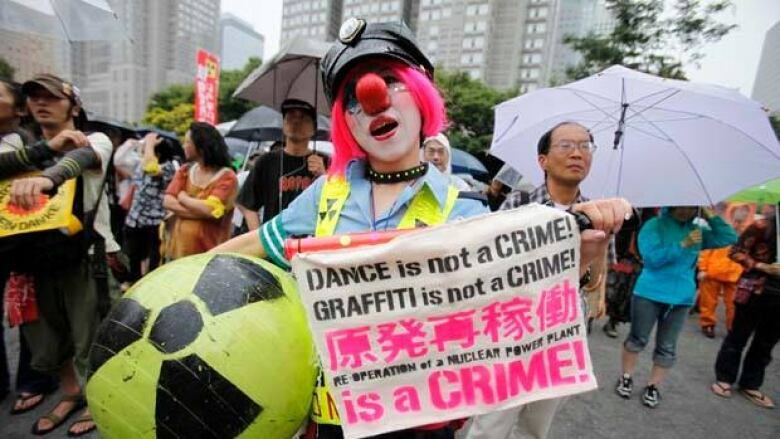 Dozens of protesters shouted and danced at the gate of a nuclear power plant as it restarted Sunday, the first to go back online since Japan shut down all of its reactors for safety checks following the Fukushima nuclear disaster. Ohi nuclear plant's reactor No. 3 returned to operation despite a deep division in public opinion. Last month, Prime Minister Yoshihiko Noda ordered the restarts of reactors No. 3 and nearby No. 4, saying people's living standards can't be maintained without nuclear energy. Many citizens are against a return to nuclear power because of safety fears after the Fukushima accident. Crowds of tens of thousands of people have gathered on Friday evenings around Noda's official residence, chanting, "Saikado hantai," or "No to nuclear restarts." Protests drawing such numbers are extremely rare in this nation, often known for orderly conformity. A demonstration in Tokyo protesting the restart and demanding Noda resign was planned in a major park Sunday. Although initially ignored by mainstream local media, demonstrations across the country have grown as word spread through social media, sometimes drawing Japanese celebrities including Nobel Prize-winning writer Kenzaburo Oe and Ryuichi Sakamoto, who composed the score for the movie "The Last Emperor." All 50 of Japan's working reactors were gradually turned off in the wake of last year's massive earthquake and tsunami, which sent the Fukushima Dai-ichi plant into multiple meltdowns, setting off the worst nuclear disaster since Chernobyl. Protesters like Taisuke Kohno, a 41-year-old musician among the 200 people trying to blockade the Ohi plant, aren't so sure. He said protesters were facing off against riot police and planned to stay there day and night. "It's a lie that nuclear energy is clean," he said. "After experiencing the nuclear bombing of Hiroshima and Nagasaki, how can Japan possibly want nuclear power?" Kansai Electric Power Co., the utility that operates Ohi in central Japan, was not immediately available for comment Sunday. It said on its website that a nuclear reaction restarted Sunday afternoon at the No. 3 reactor, a key step for it to begin producing electricity. Fukushima Dai-ichi, in northeastern Japan, went into meltdowns and exploded after the March 11 tsunami destroyed backup generators to keep the reactor cores cool.